Probably my last fill for hurt/comfort bingo round 7, it fills the 'Forced Marriage' prompt on my hurt/comfort bingo card. 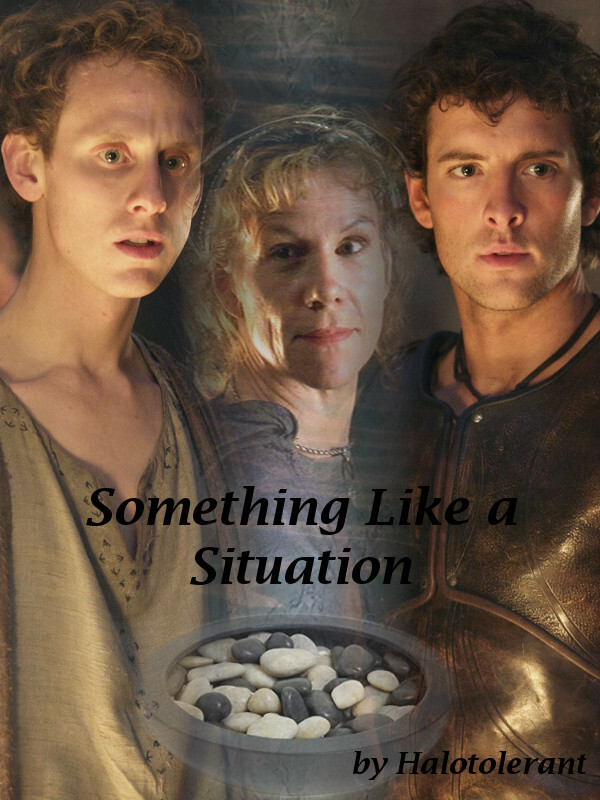 This is an e-book cover for a fic that was posted way back near the beginning of Atlantis fandom, when series 1 was still airing, and it was all fun and fluffy and silly, and Jason/Pythagoras was the most obvious pairing (for 'obvious' read 'flashing neon signs of slash that you could see from orbit'). Something Like a Situation by Halotolerant taps into that early series 1 vibe, and I honestly think it reads like something that could almost *actually* have happened in a episode back then. The boys are adorable (with a teeny bit of angst), and Hercules is hilarious, and the Oracle is... well, read it and find out! Go on, read it. You won't be disappointed. Hercules thinks a moment. “More or less." If you hven't read it you really should! It's one of my favourite 'instant feel good' fics from the fandom, and was one of the very early ones that made it onto my kindle so I could re-read it forever.